Just like my mom, I participated in annual mammography screenings. While I had no family history of breast cancer, I believed my yearly mammogram was my guarantee for early detection in the unlikely event that I was diagnosed with breast cancer. Tragically, my advanced stage breast cancer diagnosis would prove me wrong, catapulting me on a bumpy and unpaved road of patient breast-health advocacy. I had my 11th mammogram in late November, 2003 at the age of 51. My reporting results from the imaging center declared, “We are pleased to report that the results of your mammogram are normal.” Awesome, I thought, another good report. My next preventive health screening was to schedule a colonoscopy after my upcoming annual visit with my gynecologist. While my gynecologist was conducting a clinical breast exam, she felt a ridge/thickening in my right breast. Notwithstanding my recent normal mammogram, she ordered a diagnostic mammogram, targeting the area of concern. Like my prior mammogram five weeks earlier, the results of the diagnostic mammogram were normal, yet because of the palpable “thickening,” it was followed up with a diagnostic ultrasound. My relief from my normal mammogram was short-lived when I watched the technologist leave the room and come back in less than a minute with two medical folks in scrubs. Fast forward to – the ultrasound revealed a suspicious lesion, the size of a quarter, yet it had not been detected on the mammogram. A biopsy confirmed invasive breast cancer. “How could this be? I just had two normal mammograms within the last six weeks,” I said. This was the first time in my 11 years of faithful yearly mammograms that I was told I had dense breasts, which caused my cancer to be masked on mammogram for years, yielding an advanced stage breast cancer diagnosis, followed by aggressive treatments, multiple surgeries, and life-long therapies. I believed my pathology report from my single nine-hour latissimus flap mastectomy was mistaken when it revealed my stage 3C breast cancer diagnosis that had metastasized to 13 lymph nodes. I cried as I read the survival rate of my startling diagnosis in 2004 – less than 49 percent of patients survive five years – and I had never missed a mammogram appointment. What happened to early detection and why hadn’t it worked for me? Thirty-eight percent of women in a study have dense breast tissue. 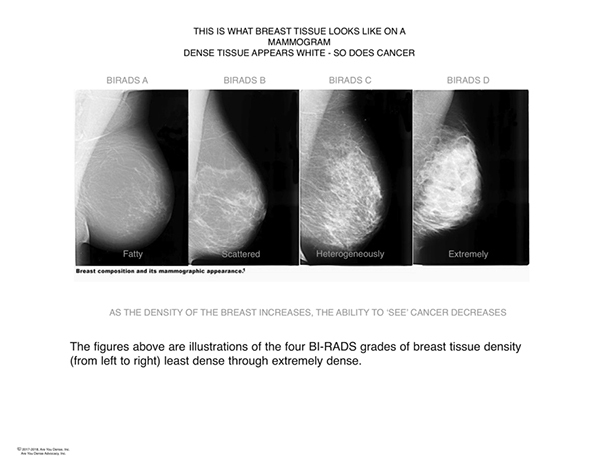 As the density of the breast increases, the reliability of the mammogram to detect cancer plummets. There are tests, when added to mammography, that significantly find invasive cancer that are not seen on mammogram. Having dense breast tissue is also an independent risk factor for breast cancer. I uncovered 11 reports buried in my health file, penned by the radiologist to my gynecologist, that were never shared with me, stating that my extremely dense breast tissue reduced the sensitivity of the mammogram to see cancer. When I suggested to my team of doctors that they should disclose dense tissue to women, leading to conversations with providers about screening tests beyond the mammogram, they refused. I was haunted by the innumerable women whose dense tissue was hiding their cancer on mammography, resulting in a delayed and advanced diagnosis and for some, death, averting the promise of early detection. Are You Dense Advocacy, Inc.
My doctors’ refusal led me and my husband to seek screening justice through legislation, and in 2009, Connecticut became the first state to report dense breast tissue to the patient as part of her mammography reporting results. As of May 28, 2018, 35 states have enacted a density reporting law, with the Illinois bill currently awaiting approval by Governor. There are four categories of breast tissue as illustrated below. Having heterogeneously or extremely dense tissue (Category C or D) is considered as having dense breast tissue. 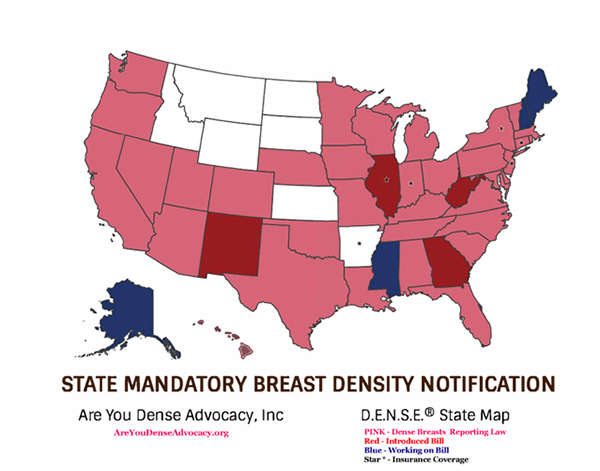 Regardless of the status of a density law in your state, ask your health care provider if you have dense breast tissue. Initiate a discussion about the benefits of breast screening beyond the mammogram. Despite nearly four decades of population-based mammography screening, breast cancer remains one of the major causes of cancer deaths in women. Research concludes that early detection by screening reduces mortality from breast cancer by detecting cancer early, leading to a decline at which women present with late-stage disease. Women with dense breast tissue, which the American College of Radiology considers at higher than average-risk, deserve equal access to the promise of early detection, avoiding a missed, delayed, and troubling advanced-stage cancer through personalized screening beyond the mammogram. Read more about our work through our Handy Guide to Screening Options for dense breasts. Nancy M. Cappello, Ph.D., is director and founder of Are You Dense, Inc., and Are You Dense Advocacy, Inc., with its mission to educate the public about the risks and screening challenges of dense breast tissue to prevent missed, delayed, and advanced-stage cancer, thus reducing mortality. Dr. Cappello’s starting advanced stage 3C breast cancer diagnosis, within weeks of her 11th normal mammogram, catapulted her to the bumpy and unpaved road of non-profit breast health patient advocacy. She is the inspiration behind Connecticut’s first-in-the-nation density reporting law passed in 2009, making the state a global leader in density reporting, adjunct screening, and the density reporting grassroots movement.